If you have a big family and are always on the go, the Grand Caravan is a great way to get around. The second-row captain's-chair seating and DVD entertainment system will keep the kids away from each other when they get bored, and the Stow `n Go seating lets you convert your family hauler into a cargo carrier with minimal effort. The Grand Caravan falls short on horsepower when compared to the Honda Odyssey, Nissan Quest and Toyota Sienna. Features such as power windows on the sliding side-doors and all-wheel drive are not available on the Grand Caravan. Some may find the Stow `n Go seats on the firm side. No major changes for 2007. The Grand Caravan is surprisingly plush inside with standard cloth-covered seats, full carpeting and a long list of standard and optional features. Grand Caravan models have room for up to seven passengers, and models equipped with Stow `n Go seating provide additional storage areas beneath the floor when the seats are not folded. Like the Chrysler Town & Country, the Grand Caravan has a smooth exterior that is slightly rounded and handsomely detailed with such features as flush side glass and Dodge's signature crossbar grille. It's a design that is decidedly sporty (as far as minivans go) and when outfitted with the 16-inch, five spoke alloy wheels, can look downright attractive. We like the way the sliding door track is hid just below the rear side glass. The base Grand Caravan is powered by a tepid 3.3-liter V6. Horsepower and torque are adequate when lightly loaded, but fill the Grand Caravan with people and cargo and this engine feels the strain. The SXT performs better thanks to its more powerful engine. The 3.8-liter is one of the best V6's Chrysler has ever produced, with terrific low-end torque and a smoothness of operation not commonly associated with minivans. As for handling, the Grand Caravan delivers an exceptionally smooth ride, but its steering and braking earn only an acceptable rating from our testing staff, as the Toyota Sienna and Honda Odyssey have set a higher standard in this area. The Grand Caravan SE has a Manufacturer's Suggested Retail Price (MSRP) of $24,070, while the SXT stickers for $28,155. A fully loaded SXT can easily top $38,000. A look at the Fair Purchase Price page shows the typical transaction price paid for the Grand Caravan in your area, so be sure to check it out before you begin negotiations. Also check the Incentives tab to see what further deals may be in the works. The Grand Caravan is projected to hold lower-than-average five-year residual values, better than the Chevrolet Uplander and Ford Freestar, on par with the Kia Sedona, but far behind the Honda Odyssey, Toyota Sienna and the Nissan Quest. The Grand Caravan SE has a 3.3-liter V6, four-speed automatic transmission, tilt-steering wheel, cruise control, four-wheel anti-lock disc brakes (ABS), rear wiper/washer, driver's side-knee airbag, air conditioning, second-row bench seat, AM/FM stereo with CD and 15-inch wheel covers. The SXT adds a 3.8-liter V6, Stow `n Go seating, power sliding doors, three-zone air conditioning, power windows, power locks, dual heated power mirrors, eight-way power driver's seat, overhead console, remote keyless entry, cassette player and 16-inch alloy wheels. Options include power sliding-side doors, power-operated rear liftgate, three-row side-curtain airbags, front side-impact airbags, keyless entry (SE models), rear-seat DVD entertainment system, Park Sense rear back-up warning system, SIRIUS Satellite Radio, Infinity sound system, power adjustable pedals, heated leather seats, trailer tow package with level control and a power glass sunroof. The power rear liftgate opens with a press of the key fob. Stow `n Go seating proves amazingly versatile without any loss of interior headroom. The 3.3-liter engine is not the best choice for the big Grand Caravan. Unfortunately, to get the better 3.8-liter V6, you have to move up to the more expensive SXT trim. If you have a big family, but your pocket book says "no" to a big SUV, the Grand Caravan might be your next-best choice. Although still referred to as a minivan by the EPA, the Grand Caravan has long since outgrown any description with the word "mini" in it. This sizable people hauler can seat up to seven passengers and features Dodge's innovative Stow 'n Go seating, which allows the second and third-row seats to be folded flush into convenient floor wells. The Grand Caravan has a long list of standard and optional equipment, but its aging design lags behind newer minivans in offering such features as roll-down sliding-door windows, and it's also behind the competition in horsepower and torque. 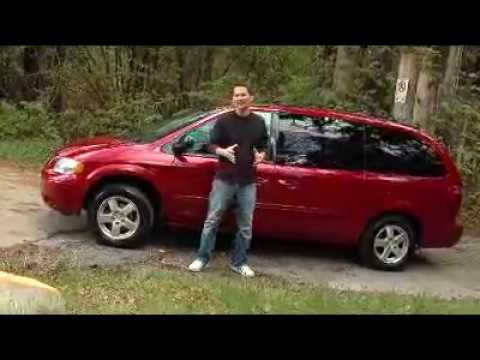 Dodge grand caravan 2007: a perfect. Family car. Car drives very well with decent mileage. Only issues we have had are with the side doors which the wiring can be broken and you either have to take it in or repair yourself in order for the doors to open and shut with the remote. The back rows are wonderful in that you can put the seats down when you need to haul large items. We have gotten large boards, couches, washers, and other large items in our van and it saves us from paying for a truck or delivery. The kids like the seating and there are several options on how you can have your kids sit depending on age and car seat situations. Car seats are easily installed. Overall we have enjoyed our car for three years and I would buy a Dodge grand caravan again. The Dodge grand caravan is a great family vehicle with all the space and safety. The Dodge grand caravan performs pretty well. There are some issues with having a car that is 11 years old though. We had to replace a few things and trying to figure out what else needs to be done. Over years the ceiling fabric has been coming down so when we bought the van the ceiling has tacks in it. It is a great family van though. As a mother of two boys the multiple row seating helps. Being able to also pick up mom friends and their children for outings. Having the extra space for trips to the lake or picnics helps too. The DVD player is 1 of the many things that is our favorite about our Dodge van. If you have a big family and are always on the go the Grand Caravan is a good van for you. The stow' and go seating lets you convert your family hauler into a cargo carrier with minimal effort. It seats 7 people comfortably. It has a DVD player which is great for kids or long trips, a radio, CD player, power windows and locks. I have only had a problem with this van 1 time in 11 years, my water pump but its a easy 60$ fix. Good on gas, city 20/hwy 26.